To our dear friend Ramie Igaña, may you rest in peace. Life is short and unexpected. Last night while scouring through Facebook, I saw a photo of Ramie together with Richard Ho (who also did the bike relay) on their bikes at the Talisay water pit stop—just minutes before Ramie fell off his bike (possibly due to a heart attack or pulmonary embolism). We pray for his wife, Dr. Humility “Mity,” and their daughter, Niña. In Shangri-La, less than 40 minutes after the swim start and while waiting at the Transition Area, Jessica runs from the beach area towards the tent. As she arrived, she took off the timing chip from her ankle and handed it to me as I sprinted towards the bike. Less than a minute after pedaling, upon exiting Shangri-La, my chain came off. Oh no! Relax. Don’t panic, I told myself. Biking while the roads were completely free of cars is exhilarating. The asphalted roads from Shangri-La towards the bridge, especially near the MEPZ area, was terrific. Lohriz Echavez-Lopez, the wife of champ Mendel and a former triathlon star was near me. Climbing the Marcelo Fernan Bridge was easy — because of the adrenaline rush. But the portion after the bridge (Mandaue side) was bad. There were patches of newly-minted asphalt mixed with the old. It was a rough, rocky ride. Scary. Passing through the Bridges mall (of Alegrado) along Plaridel St. with zero traffic, again, was a rare moment. We zoomed through the intersection (A.C. Cortes Ave.) at full speed. Wow. This is the only time when you can do this. All was smooth and easy. Until we hit the reclamation area. That’s when the headwind said… not so fast! Pedaling towards CICC, then onwards towards Radisson Blu, you could feel the wind pressure battling your face and body. The tunnel? Gliding downhill towards the dark zone, you’re in full speed. Then, as you enter, it’s dark. You have to be extra careful because, with the sunglasses on, visibility is minimal. Bikers screamed. Not in fear—but in joy. This was the chance of a lifetime—to bike the tunnel! The South Road Properties (SRP) was the toughest. The headwind slowed everybody down. It was as if a rubber band was pulling you from behind. Or a giant Iwata fan was blowing in front of you. It was tough. Plus, the sun was out. Reaching the U-turn point in Talisay City, you’re surrounded by thousands and thousands of residents, many cheering and watching. Again, another awesome sight. After the U-turn (that’s the 30-km. 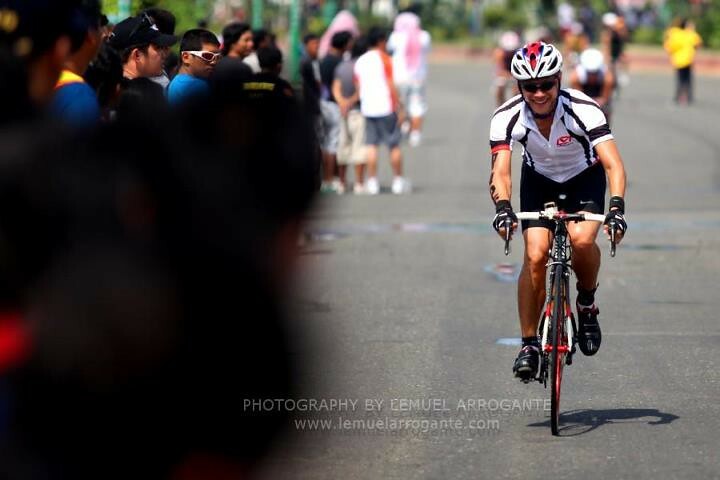 mark), it was a fast return (often reaching 40kph) back to the CICC where, again, at the Parkmall area, thousands of cheerers congregated. At the CICC U-turn point (45K), my watch read one hour, 30 minutes–I was on pace to finish in 3 hours. Then, back headed to Talisay, it was the headwind again. Painful. You just have to lower your head, pedal, think positive. The return ride was difficult. Upon reaching the bridge (past 80K), your bodily resources are low. Some walked their bikes while climbing the bridge. Finally, it was back to Mactan and, beside Lohriz, a smiling finish at Shangri-La. My time? 3:09. Slow compared to Pete Jacobs’ 2:15 split but not bad. It was only my fifth time ever on a road bike. Though I’ve been mountain-biking for years, it wasn’t until last week, when I got word that I wouldn’t run and when Chris Aldeguer convinced me and lent me his bike, that I first sat on a racer. The Triathlon event was really amazing! thx for sharing your experience!